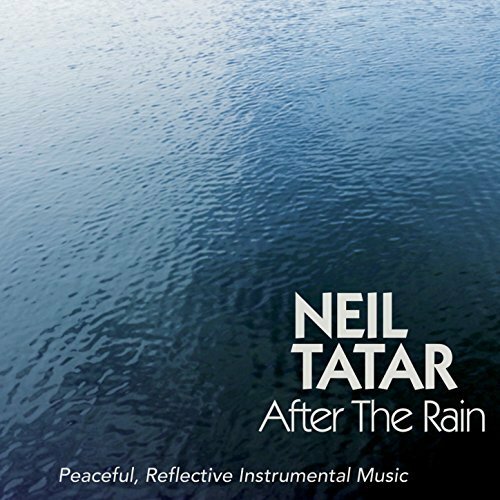 Neil Tatar is a composer, pianist and guitarist whose musical roots lie in diverse styles such as blues, R&B, light jazz and world music. Having released two previous albums, Where Did the Time Go (with cellist David Darling) and Learning to Fly, Neil’s third release, After the Rain, continues in the stylistic mode of his other contemporary instrumental works, while also softening the mood a bit in a subtle change of pace from the album’s generally livelier predecessors. 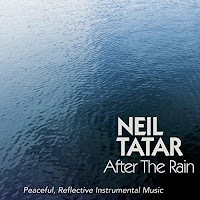 Produced by Will Ackerman, Tom Eaton and himself and recorded at Will’s own Imaginary Road Studios in Vermont, After the Rain is comprised of 10 compositions spanning nearly 50 minutes, which variably features contributions by other guest musicians such Charlie Bisharat (violin), Jill Haley (English Horn), Jeff Oster (flugelhorn), Eugene Freisen (cello), Jeff Haynes (percussion), Premik Russell Tubbs (EWI) and Tony Levin (electric and NS bass). “Gentle Steps” appropriately opens the album with gentle piano notes in the higher register that are soon joined by violin. Conveying a thoughtful tone, hence the song’s title, the melody eventually becomes a bit fuller with the two instruments yielding a crisp, clear sound as they elegantly intertwine throughout. On the next piece, “Sunsets,” Neil switches to his guitar as he’s joined by a robust ensemble of violin, soprano sax, bass and percussion. Tom Eaton additionally lends Hammond Organ while Noah Wilding provides some wordless vocal intonations. A leisurely composition with a bit of a jazz flair, it fittingly brings-to-mind that of strolling along a scenic road in the sunset. One notable highlight on the album is “When I Was Young”, which seemingly nods at the recollection of youthful memories, with all its pleasant and often bittersweet moments flooding to mind. Guided by a gentle guitar rhythm and accompanying percussion, the composition features a lead violin melody that is further complimented by the softly understated sounds of sax, cymbals and rainsticks, as wispy vocals caressingly brush against the earthy acoustic arrangement. Following up this piece is the particularly lovely “Rush Pond” with its deeply reflective mood. Here contemplative piano notes are perfectly accentuated by violin and cello, which further lend to the composition’s solemnly graceful air. The atmospherically mysterious “Night Walk” is easily my favorite piece on the album, beginning with EWI (electronic wind instrument) that soon introduces rhythmically paced guitar chords. I’m particularly fond of Tom Eaton’s signature haunting piano notes and ambient keyboard textures, which are sparsely placed among the nocturnal soundscape. Gentle rainstick and EWI further enhances the song’s woodsy feel, while ethereal vocal overtones seemingly allude to the presence of woodland fairies, as the occasional cymbal flickers like the glow of a firefly. “Sidewalk Jam” wraps things up on a decidedly uplifting, carefree note with a gently rhythmic ensemble of guitar, alto sax, bass and percussion. Conveying a subtle smooth jazz vibe, a nice little jam gets going, making it a perfectly fitting conclusion to an overall contemplative album. For more information please visit the artist's website. This album can also be purchased at Amazon, iTunes and Google Play. Deborah Offenhauser is a formally trained pianist and composer whose resume boasts an impressive list of accomplishments. Among these she has performed with renowned artists such as Isola Jones, The Four Lads, The Moody Blues and more, as well as having played piano with numerous Broadway shows. Additionally, Deborah’s music has landed various spots on television networks ABC, CBS and The Weather Channel in popular hit shows. More so, she is a highly versatile musician who also plays classical organ, mandolin, 5-string banjo, guitar and violin. 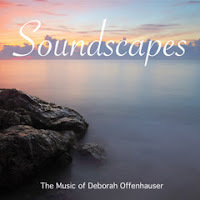 Comprised of 13 compositions spanning a little over 65 minutes, Deborah’s latest album, Soundscapes, is a multi-instrumentalist ensemble project that integrates styles of jazz, classical, contemporary instrumental and world music while also incorporating elements of avant-garde and minimalist music. “Decidedly Joyful” leads the album with a softly steady drumbeat and additional percussion possessing a tropical flair, which is subtly enhanced by the sound of ocean waves and sprinkling chimes. A leisurely, optimistic tune characterized by notable jazz influences, we’re soon introduced to an acoustic ensemble led by piano followed by saxophone and then ultimately flute. The next piece, “Free Radical”, incorporates classical strings that lend it a cinematic quality while also employing some buzzing synthesized textures along the way. Moving through different melodic and rhythmic phases, the piece transitions much like a short medley. The subsequent “Tanz” is my favorite composition on the album, beginning with nocturnal forest sounds and tinkling piano notes that immediately bring-to-mind a lush jungle. Resonating gong introduces Indian tabla and a subtle drumbeat, before an oboe ensues on lead melody playing an exotic, almost mid-eastern sounding scale, ultimately giving this world-tinged piece an intriguing journey-like feel. The minimalist “Spacial Palace” follows with ambient field noise that includes chirping birds, traffic sounds, human chatter and footsteps. More akin to a soundscape than a song, the piece is lightly adorned with various keyboard notes and effects, which eventually introduce a xylophone-type melody imbued with an East Asian feel. Next is “Through a Glass Darkly”, an elegant piece infused with neoclassical elements; it opens with singing birds and dreamy tonal waves that eventually lead into a more straightforward piano melody. Appearing near the end of the album is another notable piece entitled “It Is Written”, which features piano, oboe and classical strings with soft brushes of acoustic guitar adding a perfect touch. Concluding with rolling waves and singing birds, the piece simultaneously conveys a sense of both solitary peace and tender romanticism. Following it up is “Tanninim”, another environmental passage characterized by chimes, string plucks and a repeating drum pulse throughout. And finally, the closing track, “The Wonderful Unfoldment of Blue”, reverts again to a more orchestral motif. Despite its title, the overall solemn, classical nature of this piece feels more visually evocative of vintage objects and photos in grainy black-and-white. For more information please visit the artist's website. This album can also be purchased on Amazon, iTunes, CD Baby and Google Play. 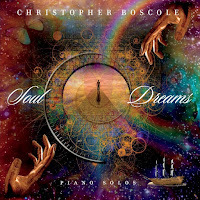 Soul Dreams is the eleventh album by pianist and composer Christopher Boscole. A Pacific Northwest native who currently resides in Hawaii, Christopher draws much of his artistic inspiration from the scenic beauty of his surroundings and sailing around the islands, infusing a colorful atmosphere of warmth, leisure and serenity into his lovely compositions. A formally trained pianist who holds three degrees in music, Christopher cites several notable composers as influences, as is often reflected in his own musical style of which spans the jazz, neoclassical and contemporary instrumental genres. 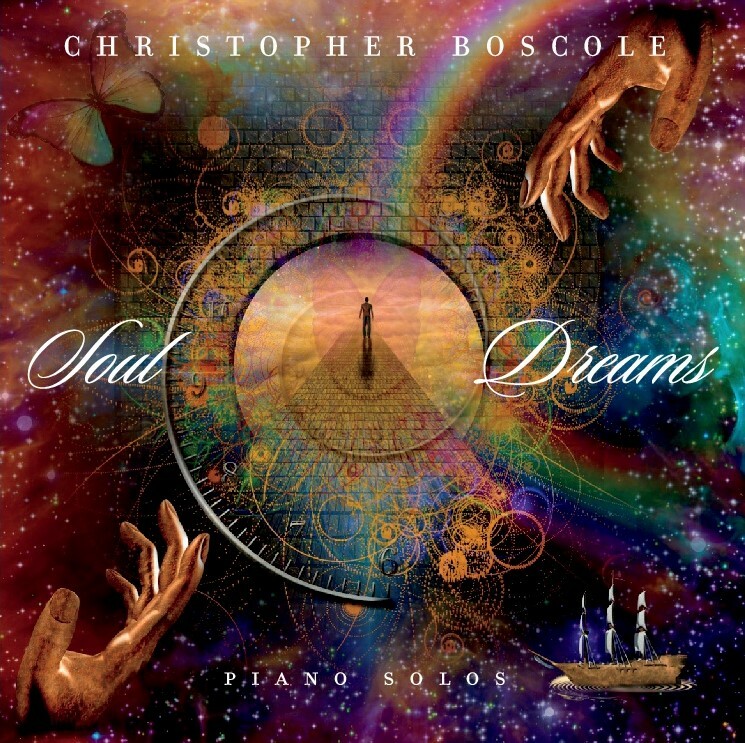 Perfectly depicted by its dreamily beautiful artwork, Soul Dreams, features twelve solo piano compositions that span approximately an hour. Like finding the elusive end of a rainbow, “New Hope” opens the album on a serenely optimistic note with Christopher’s hands seeming to glide effortlessly across the keys. Played primarily in the higher range with resonating chords in the lower range, the effect can be likened to watching sunlight shimmering upon a body of water gently rippling in the wind. One of my favorite pieces on the album is “Heart Traveler”, which seemingly conveys a contemplative sense of searching for someone or something. Supremely elegant with touches of classical and jazz, the gentle composition mostly hovers in the mid-range as Christopher plays in a graceful, flowing manner. “To See You Again” is another highlight that exudes an air of hopeful longing, as one might perhaps envision the smiling face of a loved one as the sun’s radiant glow shines upon them. The ensuing “Empathy” is a slower-paced and thoughtful piece that recalls a bit of David Nevue, of whom Christopher cites as among his musical influences. My three absolute favorite compositions on the album are grouped among its latter half, with the first of these being the title track, “Soul Dreams”. Here, spiraling chords in the mid-range remain sustained throughout, as they’re accentuated by tinkling notes in the higher register. A dreamy, almost cosmic-sounding piece, it seemingly alludes to the spiral shapes found throughout nature, of which includes everything from seashells to the Milky Way Galaxy. Similarly in this mode is the cleverly-named “Mistery”, which effectively recalls Michael Jones (who is another one of Christopher’s influences) and in particular, his Seascapes album that was released on Narada Records in the mid-80’s. Essentially an improvisational, unbounded soundscape, the piece is characterized by continuously cascading and sparkling chords that seemingly mimic a light rain-shower in the wind, as sunlight softly peers through grey skies. Christopher once again slips into this mode on the closing piece, “Suite Sunshine”, which exudes a supernal warmth and overall sense of divine love expressed through nature’s beauty. 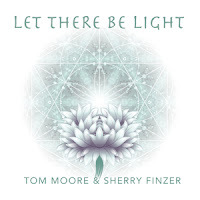 Let There Be Light is the second collaborative release by multi-instrumentalist Tom Moore and international flutist Sherry Finzer. Continuing along the musical path of their phenomenal debut album entitled Whispers from Silence, the talented pair create sublime ethno-ambient passages on their fantastic follow-up release. 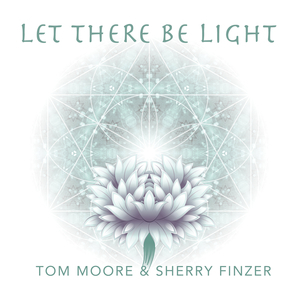 Comprised of nine compositions spanning fifty-five minutes, Let There Be Light is a sonic exploration of nature’s most omnipresent element, as the duo weave electronic and organic instrumentation into a musical mandala of seemingly Zen-like mysticism and transcendent tranquility. Despite the album’s title, the pair elegantly contrast the light with shadow by blending in darker shades of mystery throughout – thereby imparting a perfectly balanced semblance of yin and yang. “The Way of the White Clouds” opens the album with earthy drones, distant waves and acoustic textures that soon introduce a deeply resonating flute melody over subtle shamanic percussion. “First Light” ensues with an enduring drone and singing birds, as wispy flute notes convey an unbounded airiness in contrast to the earthy rootedness emitted from a continuous tonal humming. The next piece, “Timeless Journey”, is one of my favorites on the album – effectively bringing-to-mind that of a distant caravan crossing a desert at night. Here subtle Indian sitar is warmly merged with gently rhythmic bass tones, which is further complimented by the exotic scale played on flute. “A Celebration of Life” is perhaps the album’s most pinnacle moment – eliciting a sensuous vibe that somewhat reminds me of Kamal’s “Shakuhaji Tales”. Similarly guided along by a hypnotic rhythm that underlies affecting chord progressions, Sherry’s flute seemingly acts as a coy seductress inviting the listener to move along in tandem with the sensual pulse. “Waves of Light” features a flute melody played in a higher scale amidst a backdrop of celestial washes, as if seemingly ascending to the heavens. Another highlight is the mysterious “Tides of Time”, which features what sounds like an African thumb piano lending itself as part of the piece’s gently sustained rhythm. Here breezy flute tones emerge from overarching ethereal layers, as one might imagine themselves standing alone by a seashore and feeling the cool breeze as waves roll in. For more information please visit the artist's website. This album is also available to purchase at Amazon, iTunes and Google Play. Spiritual Odyssey is the fourth album by electronic keyboardist, composer and vocalist Russell Suereth. Having initially released a couple of 60’s-influenced pop/rock albums, Russell markedly shifted his musical focus to the loosely-defined “new age” genre with his all-instrumental third release entitled Spiritual Haven that drew upon subtle ethnic influences. 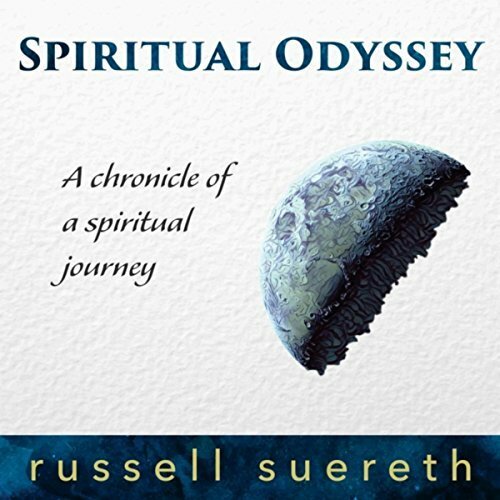 Continuing his sonic exploration of transcendental themes, Russell seems to have both literally and figuratively found his voice with Spiritual Odyssey – an album that easily outshines his previous releases to a remarkable extent. Singing in an airily carefree and low-key style that’s complimented by dreamy synthesized textures and subtle world-tinged rhythms, Russell’s melodies often bear reminiscence to that of both The Beloved and The Alan Parsons Project. Comprised of ten compositions spanning 40 minutes, Spiritual Odyssey opens with “Break the Chains”, as Russell sings mystical lyrics amid an ethereal fog of reverberating synth pads and subtle tribal percussion. As if being swept up on a magical carpet ride across the moonlit sky, a lunar glow is seemingly reflected upon the album's billowy cloudlike atmospheres, which are enthrallingly enhanced by the echoing, smoothed-out effect applied to Russell’s vocals. On the following track, “My Beating Heart”, his voice is layered with additional harmonies that are set to breezy percussion and softly muted bell-tones, which collectively elicit a curiously mesmerizing, almost whimsical essence. The ensuing “Where Will I Go” is one of my favorite songs on the album; its otherworldly haze and gently pulsing rhythm encompassing Russell’s resonating lyrical passages that offer lines such as “searching for the password to my life”. The aptly-named “A Ride to Virgo” perfectly captures a childlike inquisitiveness – particularly that of perceiving the constellations to be much nearer to earth than they are. On this piece, Russell infuses a bit of Indian sitar, as one might imagine themselves sailing at sea while gazing upon the night sky. “So Far Away” also similarly embodies an alluring, quirky innocence with Russell singing the opening line, “When I fly through the cobalt skies, I can see your eyes”, as well as asking, “Why are you so far away?”. Also notable is “The Walls Are Tumbling” with its lightly bouncing electronic textures accentuated by subtle strings and a lovely vocal melody. For more information please check out the artist's website. This album is also available to purchase at Amazon, iTunes, CD Baby and Google Play. Gaia is the seventh album by Jon Richards and follow-up to his fantastic Earthlight album – both and others having been released on Medwyn Goodall’s UK-based record label, MG Music. 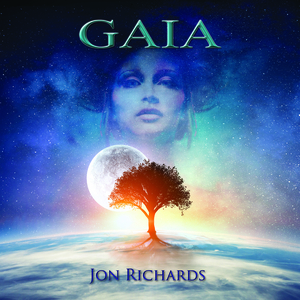 Noted for his brand of electronic fantasy and nature themed music, Jon explores further musical ground with Gaia, interweaving styles of cinematic electronic, ambient and space music with added subtle touches of rock throughout its seven compositions, of which span just over an hour. “Gaia Pt. 1” is a lengthy opener that unfolds like a medley at over 20 minutes. Beginning slowly with an atmospherically spacey introduction, a distant light seemingly encroaches as drifty piano notes suspend upon a droning expanse. Moving into a more melodic phase, electric guitar and a slow-paced electronic-rock beat come in for a bit, before quieting down at about the midway point with gentle thunderstorm and nature sounds. Shifting phases again, the piece becomes dreamier, more ethereal and glistening. Eventually morphing into a more sequencer-driven piece, it’s accompanied by an upbeat rhythm and some funky bass guitar that effectively convey a somewhat vintage feel. The next piece, “Gaia Pt. 2”, is ostensibly Enigma-inspired although possessing a lighter mood, as it similarly incorporates a chilled breakbeat and flute-type instrument with brushes of electric guitar. An adventurously beautiful piece, it feels evocative of viewing earth from space, while effectively imparting a sensation of soaring above oceans and landscapes. “Earth and Sky” is a more subdued piece with a somewhat chilly air and features an oboe-type instrument over a gently sequenced undercurrent. Eventually joined along the way by processional marching drums, this regal composition seemingly paints vivid images of the cold Himalayas. The ensuing “Rhea” is one of my favorite pieces on the album and bears some resemblance to late 80’s and 90’s-era Tangerine Dream. Guided by driving sequencers and a buzzing horn-type instrument, the catchy song quickly becomes infused with a spirit-soaring quality that’s lent by electric guitars and hovering celestial voices. “Aether” however, just might be Jon’s most stunning composition to date. Mysteriously ambient and spacey, it opens with a cold echo like the distant call of the north wind, as ensuing gentle sequencers continually spiral upwards throughout its course. Effectively bringing-to-mind the translucent colors of the aurora borealis, this mesmerizing composition evokes the wondrous beauty of a tundra sky under starlight. “Tethys” is another gentle piece that gradually nudges the listener out of the hypnotic slumber induced by the previous track. Seemingly set to the scenic backdrop of a coastal early dawn, its breezy downtempo rhythm and drifty piano notes create a sensuously chilled mood, as shimmering electric guitar textures provide extra colorful dimension. Closing out the album is “Gaia Pt. 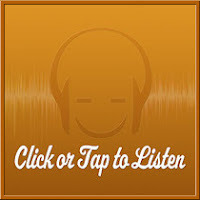 3”, which initially opens with piano followed by a slow electronic-rock beat. Bold electric guitars and symphonic elements convey an air of celebration, until the piece winds to a close with a softly sparkling trail of seeming fading light. For more information check out the artist's website. This album is also available to purchase at MG Music and Amazon.